You know how some road trips to Tagaytay might end: You stay there with your friends, with endless merry-making over beers and bulalo overlooking the Taal volcano at night, even if you don’t see a thing anymore due to the obvious darkness. Or that you want to enjoy the cool breeze for the weekend and just need a place to crash for the night. Or it can be the wedding of a very good friend, and you combine the booze, bulalo, cool breeze, and a late night rendezvous with the sandman, urging you to just sleep it off instead of taking the drive back home. For these instances, and for other reasons that require strict economic policies on your wallet, Tagaytay Haven Hotel has a decent offering for you. Another good friend actually recommended this given some good research and he nailed all that was needed for the group to get by comfortably over a weekend. Tagaytay Haven Hotel is located pretty much in the town proper of Tagaytay City. It is not the prettiest of locations as there is a major intersection filled with various public transport terminals, a Jollibee fastfood chain in front, and a large supermarket at the back. But given the market it tries to reach, this is actually the perfect location. It is not a luxurious hotel, either. It is a budget hotel, very much along the lines of Go Hotels. 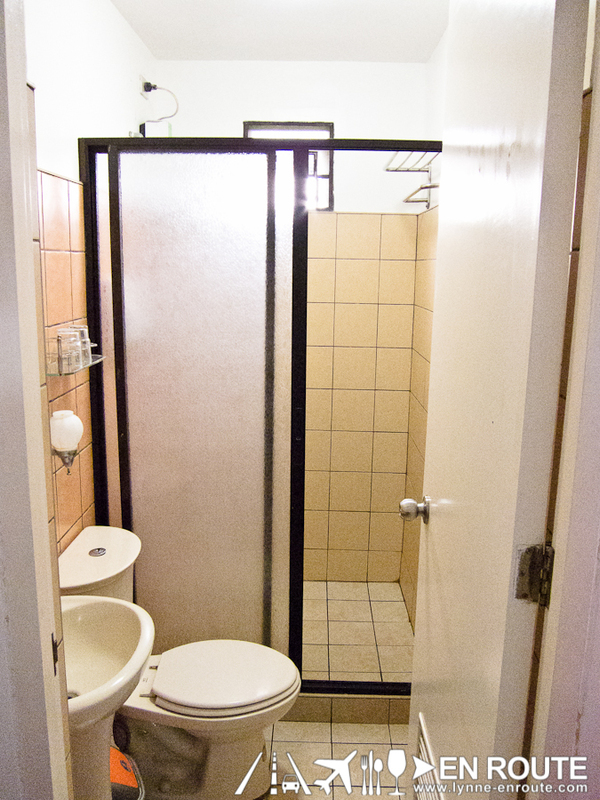 As a matter of fact, the Go Hotels in Dumaguete may even give it good competition in terms of finishing quality. 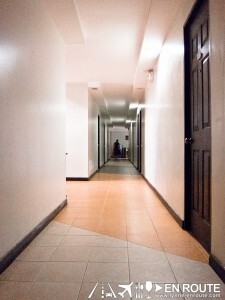 Thin dry walls that echo each and every footstep may even disturb guests who are already inside their quarters. But if there is one trump card that Tagaytay Haven Hotel has among its other peers, is that it has the large rooms that are great for groups just needing a place to crash. And the rooms are pretty good, too. Here is a room that is good for six. This costs about PHP 3,650.00 per night, coming out to about 608.33 per head. It is pretty ok and payment isn’t required until check-in (of course with that, if you don’t inform that you will be late for check-in, the room may be forfeited). Bathroom is decent as well. The doors just need a little oiling as it squeaked and fears about breaking may run through your head. But it has hot and cold shower so bath time is comfortable in the cool Tagaytay weather. 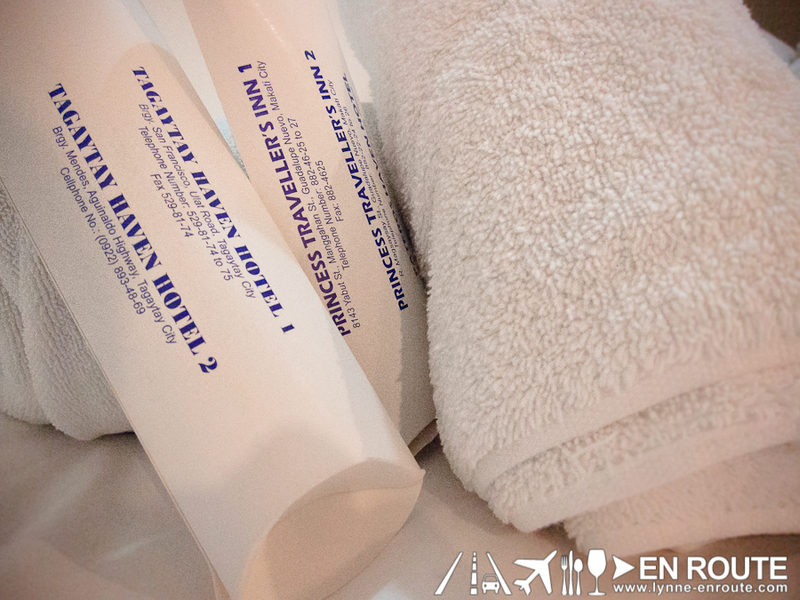 Toiletry kit and towels are part of your stay. Of course, if you choose to get your more preferred toiletry, you can just go to the supermarket outside the hotel. Rooms also come with complimentary breakfast, although only for two. The breakfast comes in the form of buffet of corned beef, scrambled egg, plain rice, and unlimited instant coffee. Free wi-fi? Yes they have it. Ironic how some five star hotels in Metro Manila can charge PHP 300.00 per hour instead of just giving it for free to the guests. So there you have it. Comfortable cool rooms, decent amenities, breakfast to get by, and some free wi-fi. Tagaytay Haven Hotel is the basic traveller’s halfway house and then some. Tagaytay Haven Hotel is located at East Crossing West Mendez, Tagaytay City. Take SLEX Sta. Rosa Exit a straight drive all the way to Tagaytay Public Market and turn right at the city junction along Nasugbu/ Balayan/Lemery Batangas road. Driving past Mendez Crossing intersection make a right turn into the hotel driveway beside Jollibee. Average travel time is about 1.5 hours. I think you just gave me an idea for a party place where we can also have an overnight stay. Hmmm. Thanks!